Before unveiling the redesigned version, Audi seems to be determined to try all possible versions of its R8. Recently at the auto show, company uncovered it’s all new power packed and exclusive features locked Audi R8 LMX 2015. The audience present at 2014 Le Mans Auto show, were surprisingly stunned at the features and performance figures company is presenting with this model. 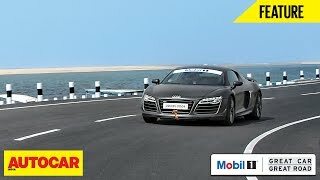 Let us have a look at the review of Audi R8 LMX 2015 to know more about them. Looking at the interior of Audi R8 LMX 2015 you might find less changes in there, but those inculcated makes it look simple gorgeous. The mostly-black covered interior gets accompanied with the accents of blue and thus keeping the entire look simple and sober. Seats are wrapped in Nappa leather featuring Sepang Blue diamond pattern while the backrest covers come stuffed in same Blue. Traces of the same essence can further be noticed with Sepang Blue stitching marking its presence over the parking brake lever, steering wheel and the center tunnel console whereas the door panels come covered in black Alcantara headlining and Nappa leather covering featuring design resembling to seats. The exterior of Audi R8 LMX 2015 to an extent resemble to its standard model, however company has made subtle changes to distinct this limited edition model. Body comes drenched in Ara Blue paint, which looks extremely gorgeous with accents of black over it. Second thing that you’ll notice is a massive rear wing made from carbon-fiber reinforced polymer and matches the hue presented over mirror caps, front spoiler lip, engine cover and rear diffuser. Looking at the face of Audi R8 LMX 2015 the traditional grille sitting amidst laser headlights looks gorgeous with its titanium gray finish. Similar pattern further can be noticed on front inlet grilles and rear outlet grilles while the exhaust pipes get the blend of high-gloss black. The Audi R8 LMX 2015 gets its power through a 5.2 Liter V10 engine generating total output of 570 hp and peak torque of 540 nm paired to seven-speed S tronic transmission. 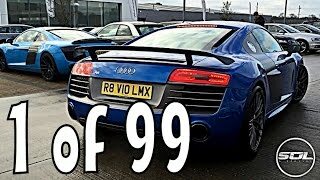 With this power rumbling its body, top speed of Audi R8 LMX 2015 touched the mark of 199 mph with it ability to reach 62 mph from standstill in just 3.4 seconds.